One of the numerous reasons why bicycles are a more civic mode of transport is that they do not make much noise. Even at the speeds cyclists can get up to, this near-silent mode is apparently still safe enough not to warrant a pedal-powered drone, say. A bell suffices, and after that it’s about taking due care and attention on both sides. As bikes slowly become the dominant mode of personal transport in cities, this shouldn’t change. Cyclists, a few idiots aside, have to rely on individual responsibility to a greater extent than motorists, partly due to their relative fragility. This is not a bad thing necessarily - it forms a thin undulating layer of civic substrate. This first aspect of The Economist’s article is borne of auto-centric thinking, and so the concomitant desires for speed and freedom … and often irresponsibility. Speed and freedom are not intrinsically problematic, but they can be. Cars moving at speed in urban areas are indeed dangerous - they are responsible for truly horrifying numbers of fatalities and injuries, and it’s a bit rich to suggest the solution to that particular problem is fake engine noise. Presumably, if people had genuinely wanted to solve this problem they’d have tried a little harder before, rather than apparently relying on the side effect of a noisy carburrettor. Without wishing to romanticise aspects of that 1906 film (yer actual bubonic plague had been lurking in that same city a few streets to the north only a few years before that film was shot) it does indicate a more progressive system, based on interdependent real-time responsive actors negotiating space far more fluidly than the averaging effects of mid-20th-century road design, where everyone eventually comes off worse. This is hardly a cityscape without noise, and note how these blurred lines of George Street enable pedestrians, bikes, trams and carts to occupy the same spaces, relying on multi-sensory feedback but essentially with shared responsibility for being aware. Remaining alert and riding the horn might become more relevant than the constant (and therefore less useful) hum of engine noise. Back in 'Western' cities, private car use will likely drop anyway, for reasons which I hope are by now obvious. (I can see that the loss of engine noise might be an issue for blind people, but would look for a specific solution - perhaps a non-visual alert only they can perceive as a car approaches - rather than reduce the quality of the urban experience for everyone (ethically dubious perhaps). Beyond autocentric, the second aspect of The Economist’s article is borne of what Juhani Pallasmaa would call ocularcentric thinking - an inability to perceive the city, or much at all, in terms of non-visual senses. If the safety issue resolves itself - through fewer cars, and people adapting - and understanding that engine noise is hardly keep the streets safe in the first place, let’s move on to two more interesting implications. One, if naturally quiet cars should generate a noise, what should that be? And two, if that doesn’t happen, what might increasingly quiet cars do for the urban soundscape? Leaving aside the spurious idea of giving people what they claim to want, reproducing the sound of the internal combustion engine would be ridiculous. It would be a skeuomorph too far - a design feature that nods to an earlier functional incarnation, with absolutely no need to. At some point a function has to replaced, and slowly takes its idioms and by-products with it. The car industry is traditionally loath to do this of course. 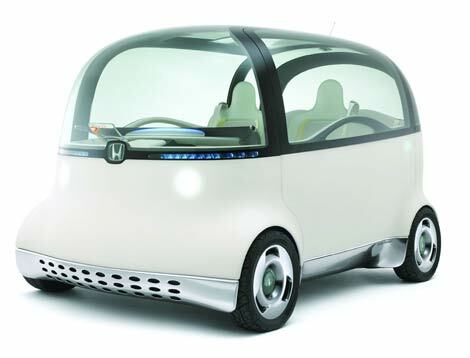 One of the most exciting features of the MIT CityCar project is that in suggesting a new driving experience. it implicitly indicates how little has changed about interface design of cars - ignition, accelerator, throttle, brake, steering wheel etc; all remain essentially unchanged for decades (save a few brave attempts from Citroën et al). This is not an issue of icon design - as with an old telephone handset representing the function to make a call on the iPhone - but an entirely new functional mode. These are new forms of mobility, potentially, and suffuse with possibility - unnecessarily tying them to vestiges of the previous mode may prevent them realising their potential. Doing this with sound would generate aural externalities that simply don’t warrant that level of intrusion. A floppy disk icon still meaning ‘Save’ in Windows 7 is anachronistic and doesn’t augur well for the Microsoft brand, but it hardly changes the essence of the immediate urban area. This is akin to the ‘I Crossed Your Path’ Facebook app from MIT’s SmartBiking, but in real-time. Perhaps the sound is a filtered rendition of the music playing in the car - RJDJ externalised rather than internalised - or is simply the music playing directly across the bodywork (one of the more appealing sounds associated with cars in cities is that of a crunching, throbbing sub-bass so impossibly distracting that one looks across and notices that the back seats have been surgically removed to create a giant bass-bin, with the entire chassis becoming a sound-generating devices. These cars also often have a glowing UV light under their skirts, and thus we can only assume the drivers are clearly amongst the most safety-conscious on the streets, announcing their imminent arrival to the blind and deaf alike.) Whether the sound of the streets is improved or further diminished by more clearly hearing this collective cacophony will depend on the musical literacy of your city. While most signals are necessary for the driver only - battery life indicators, personal messages etc. - and so best directed inwards, there may be some possibility in cars as broadcasters of something rather more enriching than the dull roar of internal combustion. As these cars will be located, addressable and responsive (sooner or later) there’s possibility of creating an interplay between their sounds and the urban environment. Cars could communicate with each other in real-time, as they pass, and so shift their sounds in response to each other to create discordant atonalities or shimmering consonant harmonies. As you drive across 110th Street in Harlem, your car cheesily fades up into the bassline from ‘Across 110th Street’, with a passing Fiat joining in on percussion while two Nissans emulate the horns and electric guitar. (Pedestrians hanging on the corner are destined to suffer the most annoyingly intermittent cover version imaginable). An array of pipa and guan strike up as you drive through Chinatown, sounds commissioned by the local tourist board. Kyoto’s pedestrian crossings are scored with the engaging knock-knock of doppler’d shishi-odoshi. I actually think that, given half a chance, we won’t miss the noise of cars (as we know it) in our cities at all. When we (Arup) design new cities, and are able to design without private car use, our city models and simulations indicate noise levels that are far more appealing. I don’t mean quiet, as cities are always noisy - as people are, and this is one of the glorious things about both - but that it was possible to hear more, in more detail, and over a wider range. Cities should not be quiet, or only replete with so-called ‘natural’ sounds - whatever that means post-nature, and post-industrialisation - but the urban soundscape is something that could use a little more room for manouevre, dynamically. To be clear, I'm not averse to cars or car noise. Some car noises are hugely appealing. It’s just best experienced as a distinct note and timbre in a richer, more dynamic city symphony, as opposed to the pervasive ambient roar of thousands of combustion engines. This latter has a totalising suppressing effect on urban sound, akin to the scourge of overusing the compressor in contemporary music production. If everything is loud, nothing is. That buses are allowed to be this way is due to an endemic lack of understanding of sound - it simply isn’t valued by many policy-makers and so rarely measured. In the case of public transport planning and procurement, travel times is seen as far more important than experience. Again, this is the outcome of an ocularcentric culture to some degree, but also a culture that suffers from a paucity of understanding of the urban experience in general. City and state government officials need not be conversant with the works of John Cage, but basic qualitative probes into the urban experience are surely important. When Jan Gehl's team were focused on Sydney's CBD, with predictable results, they also came to the conclusion that the city was particularly noisy, and due to the combination of buses and urban form (tight canyons). In an article in the Sydney Morning Herald's glossy (sydney) magazine last year focusing on noise, Gehl said "Sydney has tremendous noise levels in most streets and squares ... The main cause is the buses that create a tremendous roar when they accelerate and a shrieking sound when they brake." The Herald measurd decibel levels in several places in Sydney's CBD and also managed to record over 100 decibels outside the Queen Victoria Boulevard, noting "any exposure to noise above 85dB can permanently damage your hearing - any exposure above 120dB, however brief, can have far greater consequences. High noise levels are also associated with hypertension, stress, heart damage and depression." Oh joy. However, this focus on volume (and decibels) as a measure of sound is a little crude, leading naturally to noise abatement rather than a more expansive palette of sound. How high and low frequencies might interact, or more qualitative, descriptive aspects of sound, are rarely discussed or devised. So with heavily car-scaled cities like Sydney, or Los Angeles say, it's almost impossible to imagine how different these streets might sound without cars. With a new suburb like Vauban in Freiburg, Germany, which has been planned to effectively function sans autos, the aural possibilities should be fascinating. Typically, this New York Times article on Vauban makes very little reference to how different it might sound. There is only the tantalising line: "When I had a car I was always tense. I’m much happier this way,” said Heidrun Walter, a media trainer and mother of two, as she walked verdant streets where the swish of bicycles and the chatter of wandering children drown out the occasional distant motor." It would be interesting to explore how a city’s sound might be articulated, either naturally or by design, without the presence of pervasive engine noise. If conversation is as loud as, say, 55db, should an electric car be about the same? Or should a car's engine be effectively silent, so our streets become defined more by the sound of an espresso being made, the grind and whirr of contemporary industrial machinery, chatter, whistling, a parakeet, trees in the breeze, lapping water in the harbour, chimes of ringtones, the rumble of trains and the foghorns of distant ships, a record shop or a violinist tuning up, a pub argument and sundry art installations, the bells of a clocktower, prayer calls etc.? The Positive Soundscapes project indicates the range of noises that people may find appealing is actually far broader than this - "car tyres on wet, bumpy asphalt, the distant roar of a motorway flyover, the rumble of an overground train and the thud of heavy bass heard on the street outside a nightclub, a baby laughing, skateboarders practising in underground car parks and orchestras tuning up." And though I note “the distant roar of the flyover in that list”, I’d rather hear more about the results of their research than Dr. Rosenblum’s. I don’t think we’ll miss the noise of cars much, apart as something special. And cars can be something special in the urban environment (as I hope my decision to illustrate this piece with snippets of Sisek make clear). Cars are essentially about freedom not transit. Cars are for fun, not for the daily grind. They may increasingly be seen as out of place in a busy city on a Tuesday morning at 0830. The idea of them as mass transit, for most people, given ever-increasing urbanisation, is faintly ludicrous. Instead, they're for casual use, for the sheer enjoyment of the driving experience. Something for the weekend, if you like. In that respect, their sounds can be considered as something special too. We can more fully appreciate the throaty purr of a 1969 Ferrari Daytona or the brawny roar of a 3.5 litre 1978 Ford Capri or the lawnmower rattle of a 2CV or the saucy throb of an old DS, lifting skirts and all, just as we’ll always appreciate the sizzle and hiss of tyres on wet road. The corollary of this is that we won't particularly miss the sound of a 2002 Mazda 323 or a 2007 Honda Jazz or a 2004 Holden Barina or 1998 VW Golf. These kind of cars are, after all, by far the most prevalent on our roads. Peter Cusack’s Your Favourite London Sounds - a favourite indeed - also lists a few traffic noises (”16th floor up, London roar from the top of a tower block, Holloway Road, on a damp evening”; ”Taxis waiting at Euston Station, squeaky black taxi brakes”; ”Under the flyover, Hackney Wick”). But they’re by far in the minority. (Have a listen to the archive; see also Beijing and Chicago.) Removing cars would enable the other sounds to be picked out more clearly, also accentuating urban difference, in that cars tend to be a somewhat homogeneous globalising force - due to their high production costs, they are essentially the same across the world; the platform for a VW Golf not only services the Golf, but the Skoda Octavia, Seat Leon and Audi A3. Toyotas are largely the same in each city; pigeon whistles are not. Yet rather than position this as old (local) versus new (global), it may be that the ‘electric car as noise generator’ discussed above provides an opportunity to create new local sounds. Scoring the city is an interesting idea, whether via discrete car-based sounds or taking advantage of the absence of car-based sounds. Strong urban places already have their own signature, through their behaviour, a point made by William H. Whyte in his 1980 book Social Life of Small Urban Places, when he and his team rendered the patterns of movement through the plaza at Seagram's in New York as a form of graph. The opportunity to genuinely explore the sound of the city without this blanket of private cars is compelling, whether through sculpting sound through active intervention or simply through enjoying a level aural playing field for the everyday sounds that already conjure the city. At first glance, taking The Economist to task for suffering from a severe lack of creative imagination might seem a little like admonishing Cristiano Ronaldo for not spending his Sundays reading Žižek. But let’s at least discuss how sound and the city should best intersect given the emergence of this new mode. We can slowly fade down the volume on that wall of noise - what might we want to hear its stead?